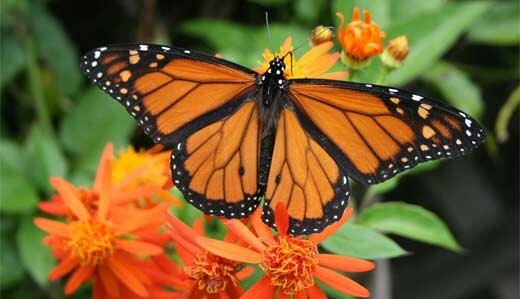 A large, bright-orange butterfly whose migratory North American populations travel distances of up to 3,000 miles. Habitat change, climate change and widespread use of insecticides and herbicides are causing monarch population declines. This large, bright-orange butterfly is renowned for its impressive annual long-distance migrations. The two best-studied populations are the migratory North American populations, which travel distances of up to 3,000 miles (4,800 kilometres) between British Colombia and California, and between Southern Canada and central Mexico. During the summer, several successive, short-lived generations are produced, which complete their entire lifecycle within a period of two to eight weeks. The last summer generation is unusually long-lived – it migrates southward in autumn and survives the winter. Millions of butterflies aggregate in the southern overwintering grounds, where they remain in a state of relative inactivity for most of the winter. They begin mating when spring approaches and then return the thousands of miles to their northern breeding grounds. Females lay their eggs on milkweed plants along their northward journey. After hatching, the voracious caterpillars feed on the leaves, increasing their mass by almost 2000-fold over a period of 9-14 days. They then undergo metamorphosis and form a chrysalis, from which, after a second metamorphosis, the adult butterfly hatches after another 9-15 days. Milkweed contains toxins called cardenolides which do not harm the caterpillars and are stored in their tissues. The toxins remain in the butterflies throughout their lives, making them toxic to predators. Naïve birds who have not yet learned to avoid monarchs get sick and vomit when they make the mistake of eating one of these butterflies. The Monarch Butterfly’s reliance on milkweed makes it very vulnerable to habitat change via human activity and climate change. Widespread use of insecticides and herbicides is also causing monarch population declines. Range: From southern Canada and the entire United States to Central and South America. This species has also become established on several Pacific Islands, Australia, Indonesia, the Canary Islands and Spain due to accidental introductions by humans.